With everyone decorating their trees with old loved baubles, we thought we would help you add a sparkling addition to the collection with our free template! 1. Download and print your free tree decoration template. Cut out all of the elements on your printable. 2. With a strip of Washi Tape, stick the first tree on the top left hand side of your template, to an A5 piece of Dovecraft green glitter card. Carefully cut around the shape, following all of the cut lines on the printable. Cut around the same tree template once more on the green glitter card. 3. Cover one tree with Dovecraft Perma Fix tape, loop a length of Dovecraft Twine to the inside, at the top. 4. Stick the second glitter tree to your decoration, ensuring to line it up with the first tree. 5. 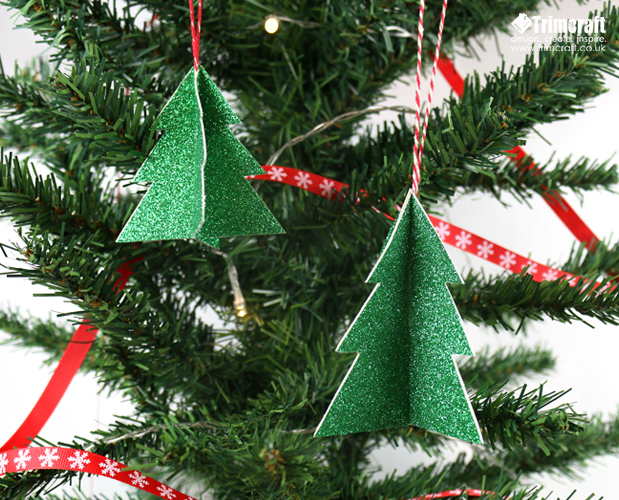 Take the tree template on the top right hand side of your printable and cut around the tree shape twice on to green glitter card and stick them together with Dovecraft Perma Fix Tape. Trim the edges if needed. 6. Slide the two tree sections together using the cut lines you added. This glittering decoration will look lovely hung on your Christmas tree and it won’t take long to make. There is also a smaller tree template included on your printable that will look brilliant alongside one of the larger trees!